Now, apparently you have to be careful about which edition of this book you pick up. A fairly new version was released, abridged. You want to find a copy from 1980 or earlier. Treasures of the Snow was first published in 1950. (Subsequently, it was turned into a film which I am now very curious to see.) It was written by Patricia St. John who was born in 1919, the third of five children. Her parents had been missionaries for a time (although Patricia was born after they had returned to their home in England). When Patricia grew up, she also became a missionary, serving in Morocco. She never married, but worked alongside her brother. She died in 1993 due to heart problems. St. John set the story Treasures of the Snow in a small town in Switzerland. She and her family had lived in Switzerland for a short time during her growing up years and she had fond enough memories of it to want to write a story involving the area. Although this isn't necessarily a Christmas story (I was not reading it because of the season we're currently in, but because I was looking for a pleasant read one afternoon and I suspected this would do well) I'm going to label it a "Christmas read" as many of the major events which happen in this book happen at Christmastime. This book is 220 pages long (at least, my copy is!) and contains short chapters. I think it would work well for children ages 8 on up. I definitely plan on holding it back a bit before I introduce our kids to it. When they are old enough, I will be glad to read it with them because 1. I like the story and 2. it has family history attached to it. Also, I have to say I might have liked it just on the basis of the main character's name being Annette. Every time I read her name, I smiled. (You don't run into too many Annette's these days!) Besides my blogger friend, that is also my mother's middle name. Do expect this book to be preachy, but not unbearable. Having never been to Switzerland, I can't attest to St. John's descriptions. However, she used the words "Christmas", "snow" and "chalet" enough that I enjoyed the setting thoroughly and would now like to go and visit sometime. Thank you, Caryn, for the gift of this story! * Bloggy family history: Caryn posted a review here of Uncle Tom's Cabin back in 2007. I've linked to it for old times' sake. I read St. John's books (most of them, anyway), as a kid and liked them. I've had my eldest read one so far, but I think it's time to pull out this one and give it to her. It is the right time of year! I was so curious which version you read. I've heard the original is incredible, and it does sound like a good story, and have been on the look-out for it for a couple years used...not knowing it was about an Annette. Thank you for sharing this one. I need to keep it on my radar...and will avoid our church library's copy in the meantime since it was recently published. I just finished reading her book, "Star of Light" yesterday. Actually, re-reading it, as I had read it as a child. I agree, I think she does a very nice job being "preachy" in a way that is not off-putting. I read "Treasures of the Snow" as a child also....I guess I'll have to go in search of a copy to add to our library. Somehow we missed out on St. John as my kids were growing up. Somehow I missed out on her even as I was growing up! Sounds like a great read. I am shocked . . . shocked . . . that you never saw the movie. That was the One Approved Movie to show children. Nonetheless, as I recall it's still a pretty good story. I should hunt up a copy and see if Duchess enjoys it. I am shocked that anyone would do an abridged version of this book. It's not that long! I read this several times as a kid, and I agree with your take on it. It is preachy - but not in an annoying way. What I liked is that Annette is allowed to feel anger. The author grants that she has justification, and she is not expected to be a saint. However, she allows bitterness and a desire for revenge to take root, and it damages her more than it does Lucien. This is where the Dinsmore books are unrealistic - and I think damaging. The ideal presented is one where it is not okay to feel negative emotions. I can also testify that this is the ideal in ultra-conservative groups. Particularly for females. One more thought that I forgot. It helps that Lucien must see the error of his ways and try to make amends before forgiveness is extended. One of the problems that I have seen in how Christians handle the issue is that there is a push for "reconciliation" after a serious wrong, before a true change in the perpetrator. It's one thing to emotionally release the anger and bitterness, and another to go back as if things never happened. Because the reader follows Lucien's transformation, it doesn't feel as if he gets off scot-free from the consequences of his bad actions. And his attempts to make amends demonstrate that he has in fact experienced a change of heart. I enjoyed this book (and the movie!) while growing up. Reading your review makes me want to read this book again. @DofanA: I couldn't agree more with your last thought re: Christians and forgiveness. I'm glad you came back to add it after you forgot to. I didn't remember many of the details of this book, but when you were going over them it all became clear and I was thinking "I need to read this again." I do remember really liking it. @Annette- laughing about the cow. hahaha!!! @Tim - On the subject of forgiveness I do agree with you. I think. It IS a hard subject and lately I've noticed it's getting a lot of notice. We cannot be bitter and so we need to check our own feelings and emotions internally and actively work on forgiveness. (When I say "actively" I mean hourly. And sometimes I have to work on forgiveness every other second.) Certainly things should NOT be expected to be the same when the offender has really wounded the person. Actions have consequences after all. Things WILL change. Yes, really, I think we agree. The first time I read this book I was around 11 and we had recently moved. I was a touching moment and was crying (yes, I was emotional reader) when my mom opened my door because she was showing the house to some one from our church. I felt kind of sily, but I still have fond memories of the book and recently had my kids listen to the audio book. I read an original when I was about 8. I remembered liking it. I have not re-read it and it has been on my list for awhile. I did buy a copy for my kids but it was a new publishing and I could tell it had been changed. 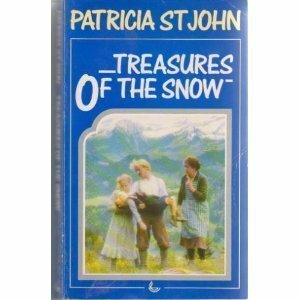 I liked Patricia St John books. I plan on reading them again! My absolute favorite was, "Three God Searching." Regarding the book, I've been looking for an older copy to share with my kids, but haven't gotten one yet. Surprisingly, our library (in a liberal, university town) has it, so I really just need to make the time to read it aloud. Thanks for the reminder to check it out!